Attila and Eskimo Callboy have announced a fall European/UK tour. You can see the dates for that run below. Caliban have premiered a new video for their new song “Ich Blute Für Dich.” This track features Matthias Tarnath (Nasty) and Sebastian “Sushi” Biesler (Eskimo Callboy), and it will appear on the band‘s new album “Elements“ (out April 6). The first set of bands have been revealed for the 2017 Nova Rock Festival. The event will take place June 15-17 in Nickelsdorf, Austria and will include: Green Day, Prophets of Rage, Rancid, In Flames, Broilers, Me First And The Gimme Gimmes, Hatebreed, SSIO, Eskimo Callboy, and Jamaram. Five Finger Death Punch’s tour with Papa Roach and Devil You Know has not been going to smoothly, due to the recent terrorist attacks in France, terrorist threats that prompted the cancellation of their Milan, Italy show, and security issues in general. Now, the band have decided postpone their November 26 show in Brussels, Belgium, due to it being on lock down because of terrorist threats. Despite this, the band have decided to finish the trek, without Papa Roach and Devil You Know who have decided to go home. Since they won’t be present, the supporting acts for the November 25 show in Düsseldorf, Germany will include Eskimo Callboy, Skindred and Nothing More, and the supporting acts for the November 28 show in London, England will include Skindred, As Lions and The One Hundred. “Despite some significant challenges in Europe since the horrible events in Paris recently, we have continued on our tour and remained dedicated to our mission of providing you, the fans, the highest quality show in the safest possible show environment. As a result of new & increased travel/transportation restrictions and challenges, in some cities we are scheduled to play, we are unable to fulfill this promise, so we were forced to postpone those shows. We continue to face additional challenges but remain committed to finishing out the tour as best as we can. We are not a band that is used to postponing or canceling shows. In fact, we have always prided ourselves on showing up onstage no matter what, so these extenuating circumstances have been particularly challenging for us, as artists, given the high standard we place on ourselves to deliver for the fans. Five Finger Death Punch will finish out the remaining European tour dates without Papa Roach and Devil You Know in Düsseldorf, Germany and at Wembley Arena in the UK. 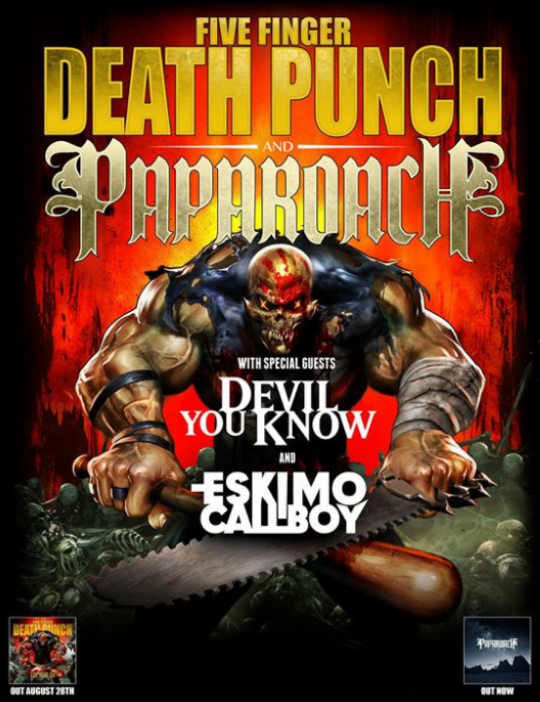 The lineup for Düsseldorf will include FFDP, Eskimo Callboy, Skindred and Nothing More. For Wembley it will be FFDP, Skindred, As Lions and The One Hundred. “It is with much regret and disappointment that we are forced to announce the postponement of our remaining European tour dates. The well being of the band members, crew and of course the fans is absolute priority for us and in the wake of the recent tragic events and ongoing threats throughout various parts of Europe we had to make this very difficult decision to ensure everyone’s safety. This is a very fragile situation which none of us have ever faced before, please know that our entire team did their very best to make the continuation of this tour possible despite the increasing daily concerns and uncertainties. The past month has been an amazing experience for us performing to sold out crowds across much of Europe and Scandinavia with our Brothers in Five Finger Death Punch and Papa Roach.